There’s a breakdown in understanding of what’s in bread. Before you break bread with someone you should know what you are consuming. The problem is not many people understand there is a problem, much less why they feel poorly after ingesting bread and other items containing gluten. To “break bread” means a variety of things to different people. It is a metaphor for making peace with someone. To “break bread together” is settling an argument. If someone asks you to “break bread” with them, you are being invited to enjoy a meal together. In spiritual circles “breaking bread” is sharing communion, a symbol of Christ’s broken body and His sacrifice for us. Let’s get the beat–the breakdown–on breaking bread together at a meal, and why you should be careful about the source of your gluten. 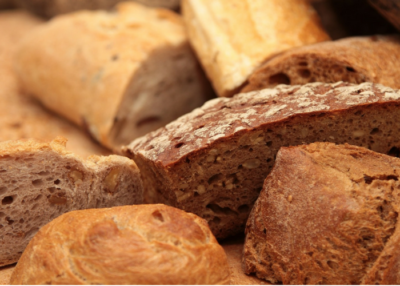 Gluten is the name for a mixture of proteins found in wheat, barley, rye, oats and all their derivatives. In the last 5-10 years the term “gluten sensitivity” has exploded into use. Before that time I can scarcely remember hearing about gluten, or that people had distress when eating it. Today I hear about it just about everywhere. Restaurants have gluten free options and food labels proudly proclaim “gluten free” for people that have a sensitivity to them. Why are people suddenly so sensitive to gluten? As gluten sensitivities were coming to light there was an awakening in my home. My family was in counseling because we thought our oldest daughter was acting out in her behavior. On the outside it looked like this firestorm of energy, brilliance and wonder that so many want to bottle when children are young, was unmanageable. Her behavior was a tornado that erupted without warning, and we were afraid of her. We turned to family counseling for a solution. We were beside ourselves as we realized that family counseling couldn’t help us. Over the next 5 years we came to learn her sensitivities were to sugar, dye, and gluten. Sugar is like a drug, and you can read my take on it here. Dye is briefly touched on here. All hell breaks loose when sugar, dye, and gluten combine in my daughter’s body. There is no exaggeration in that statement, it’s significantly downplaying the reality of the situation. This past summer we spent some time out of the country. We didn’t alter our diet. We embraced the local fare and our girls were able to enjoy delicious pasta and bread without adverse reactions to their behavior. It made us wonder what was different about the gluten we ate abroad, and if it was processed differently. Our conclusions were that the gluten products abroad were fresh, non-GMO, and that there is something different about wheat abroad than wheat that is domestically grown. The discovery here is about gluten, and it’s not my family journey, it’s your food journey, especially if you are gluten intolerant. You may want to sit down for this. Here we go. Our food, especially processed food, is being sprayed with chemicals that build up in our system and our bodies grow more intolerant of them the more we consume. That’s no surprise you say? What if I told you that Monsanto’s Roundup (the weed killer) is being sprayed on your food? Because it’s easier to harvest wheat. Please don’t go believing that all wheat farmers spray Roundup on their crops, because it isn’t true. That simple fact may be why you experience gluten intolerance when enjoying bread or pasta on some occasions, and not others. It isn’t the food itself, but the processing that is in question, and it is an acceptable industry practice to spray Roundup on wheat fields a few days before harvesting the crop. Some farmers use Roundup as a preemergent treatment. Whether wheat is sprayed throughout the growing season, or just prior to harvest doesn’t matter. 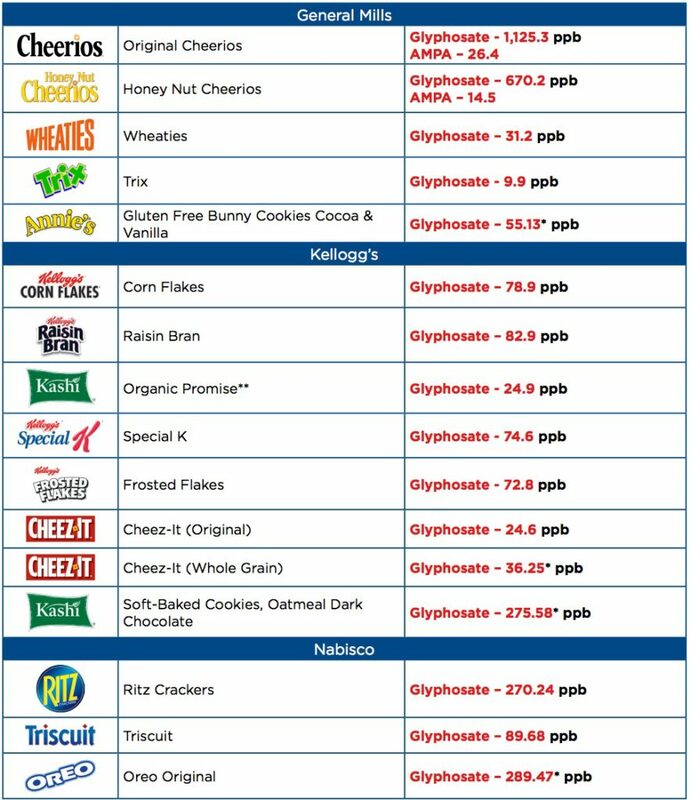 The result is that glyphosate, a broad-spectrum herbicide and crop desiccant found in Roundup, is showing up in the food we consume. 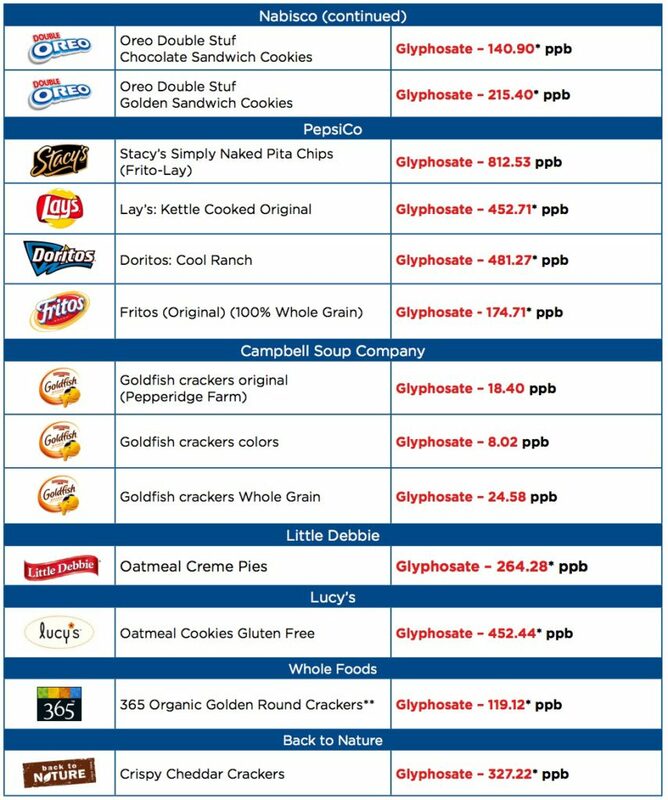 Read the full glyphosate report here. I was surprised to find Cheerios on the list. I occasionally pick up a box of plain Cheerios because the kids can self-dispense breakfast while mom and dad sleep in on Saturday morning. If the Eat This, Not That dietitians feed it to their kids on occasion, it can’t be that bad. Wrong. I think I’ll find a better alternative. 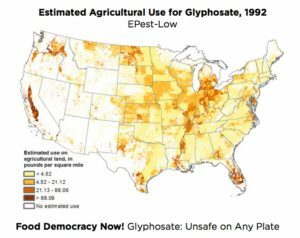 How much glyphosate is safe? The Detox Project says the acceptable daily intake differs from country to country. It has been set at 0.3 mg per kg of bodyweight per day (written as 0.3 mg/kg bw/d) in Europe, and 1.75mg/kg bw/d in the USA. Revisit the charts above with those guidelines in mind. Are you alarmed? European countries are some of the healthiest eaters in the world, so it is not surprising that they are among the first to wake up to the danger. The Netherlands has banned the use of Roundup after it began showing up in samples of bread. France will likely follow their lead. We are slowly reintroducing bread and pasta back into our diet if I made the products at home. Our discovery is that the girls can consume pasta and bread made at home, but not if we enjoy a meal out. At first I was very careful about my choice of flour and only used King Arthur Flour. I’ve found Bob’s Red Mill Organic Flour works just as well. Follow those links to have Amazon will bring them to your door if your grocer doesn’t have a flour to meet your needs. 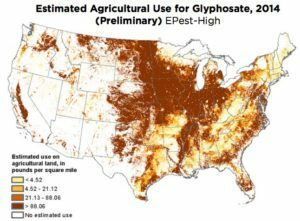 There is little doubt we will hear more about glyphosate. This video sums up the dangers. Now that mainstream media is picking up the story hopefully we will hear about precautions taken to avert the dangers soon. Please share this with someone who experiences gluten intolerance, but doesn’t understand why. Don’t forget to join the Facebook community to continue the conversation, share recipes, and engage on trending news articles. A very interesting article Nicole! Well done. I love Bob’s Red Mill products. I do not have the availability to purchase King Arthur flour though locally. Hi Karen! Glad you liked the article. I think it is important for people to understand there is possibly another reason for their gluten sensitivities. Are some people still gluten intolerant? Yes, and many aren’t. It is a live and learn sensitivity and the reactions to gluten become more noticeable with time and build up. Bob’s Red Mill has a line of great products. Glad they are available for you. Karen, I suspect you like to bake, and know how important quality ingredients are to one’s health. Glad the Bob’s Red Mill products are available to you. When you have such a great product at your disposal there’s little need to look for anything else. Bob has an interesting back story as to how he got his start too.